Saturday, October 14 at 7:00 p.m. In conjunction with our exhibition Sound and Vision, acoustic instrumental ensemble Trepanning Trio and exhibition curator Christopher Auerbach-Brown present a free community concert using their signature “classical, traditional and handmade instruments (i.e., viola da gamba, kalimba, guzheng, pan lids screwed onto sticks and played with violin bows, etc).” Seating is open, so please come a bit early and enjoy the show! 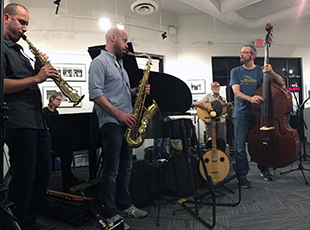 Since its unofficial formation in 1998, this Northeast Ohio-based ensemble has assembled an unlikely rogues’ gallery of more than two dozen musicians, composers, artists, writers and ethnomusicologists. Contrary to its name, Trepanning Trio typically performs with a rotating lineup of six to twelve musicians. Despite their diverse backgrounds, they bring hundreds of years of experience to bear on a repertoire forged by a shared passion for sound, texture, rhythm, melody and experimentation. The band’s name derives from the surgical procedure in which a hole is drilled into the human skull. Cave paintings suggest that people once trepanned the skulls of the living in order to let evil spirits escape, thereby curing seizures, migraines, and mental disorders.